I am in the midst of a larger work I hope to publish very soon where I will be sharing my research about the impact of technology on education and my “predictions” of where I believe schools are headed. As a part of this larger work, I am looking at the impact of technology on other significant industries in America and around the world. Over the next few weeks, I thought I would post here some of the technology driven industry changes I’ve researched. As always, enjoy and comment!! While the internal combustion engine and electrical power generation may be the most notable developments commonly associated with The Second Industrial Revolution, the telephone was clearly a fundamental enabler and itself a driving force of economic and societal change. A long distance phone call at the turn of the century was referred to like this, “This is an annihilation of time and space which would belong in the realm of magic if it was not a commonplace of daily experience.” (2) Indeed, the telephone fundamentally, and singlehandedly I might add, transformed everyday life around the world forever. End of story…the same story in 1880 and 1980!!! The other user didn’t know who you were, until you told them…and you wouldn’t know who is calling until they told you. And one of the most startling and truly unbelievable aspects of the telephone one hundred years into its existence with what was thought as near total market saturation (in January of 1976, 30.9 phones per 100 members of the US population were installed (3) …another way to view it, a household of 4 would have 1.2 phones), even with all these factors, individuals could not own a phone. Looking back from where we sit today, some 30 years out, this seems unbelievable. The telephone company was able to maintain so much control over its products that you could not even buy one; you had to rent it from them…brilliant!! Brilliant and totally unbelievable that this was acceptable and considered standard operating procedure to the general public for so long. Two government driven exercises came along that would bring change to the telephone industry…the anti-trust case against American Telephone and Telegraph filed in 1974 and the Telecommunications Act of 1996. These two events drastically changed the business of providing telephone service and drove changes in the core network. But those core changes were virtually invisible to the calling public. When a caller placed a call, there was no indication of how many RBOCs, CLECs or Long Distance Providers might handle the call or if any of the call made its way over a data network in the form of VoIP…nor did the calling public really care about any of this. Even prior to government’s involvement, there were significant technological infrastructure changes in the telephone’s first century. The network came into existence enhanced by the move to automated switching from operator switching early on. And in later years, the network began its gradual transition to digital transmission in the network backbone. And in the 1970s touch tone dialing began to replace the rotary dial. But again, none of those changes resulted directly in any fundamental difference in functionality of the technology used by the general public…it was still an audible conversation and you still had no idea who was calling until they audibly identified themselves…and even with that, you had to take their word for it! Changes to the features of the telephone itself were slow to come. Significant fundamental change to the telephone would only come with the proliferation of new technology in mobile handsets built upon the 1G but really more on the 2G cellular network infrastructure. These phones were digital through and through and feature rich due to the technology included at their core. The first hand-held mobile phone was demonstrated in 1973, however, It would be 1983 before mobile phones were commercially available. That phone came in the form of the Motorola DynaTAC 800X. Even though the Motorola phone was commercially available, at a reported $3,995 (4) they were a bit out of reach of most. But by 1990 there were some 12 million mobile phone subscriptions in operation. Driven by rapid improvements in the core technology and fueled by the growth in and commingling of this thing called “the internet”, by 2010 mobile phone subscriptions grew to 5 billion!!! So from 1983 to 2010 the number of mobile phone subscriptions went from 0 to 5,000,000,000 or some 70 percent of the global population. In 2001, another technology driven phenomenon began to occur. Every year through 2000, the number of installed telephone lines as a percentage of the US population rose to a peak of 66.88%. But in 2001, that percentage began to drop…down to 49.2 in 2008…while the number of US mobile subscriptions rose to an astonishing 86.79% in 2008 (5). Fundamental technological change had arrived and these adoption percentages reveal the impact. In 2010, 26.6 percent of US households no longer had a landline installed, opting instead for a wireless phone (6). Why? Technology driven features. I argue today’s smartphones should not really even be referred to as phones. The calling feature is truly not even a secondary or even tertiary function of the device any longer. Texting, status updates, web searches and email far exceed phone calls in terms of percentage of usage of a smartphone, particularly among young users. If early 20th Century phone users felt the long distance calls were very nearly magical, what would they think about what we do with telephones today? The telephone industry is certainly one of the largest industries that has truly been transformed by technological advances in the last 30 years. 1. Bell, Alexander Graham. Improvement in Telegraphy. 174465 US, March 7, 1876. 2. 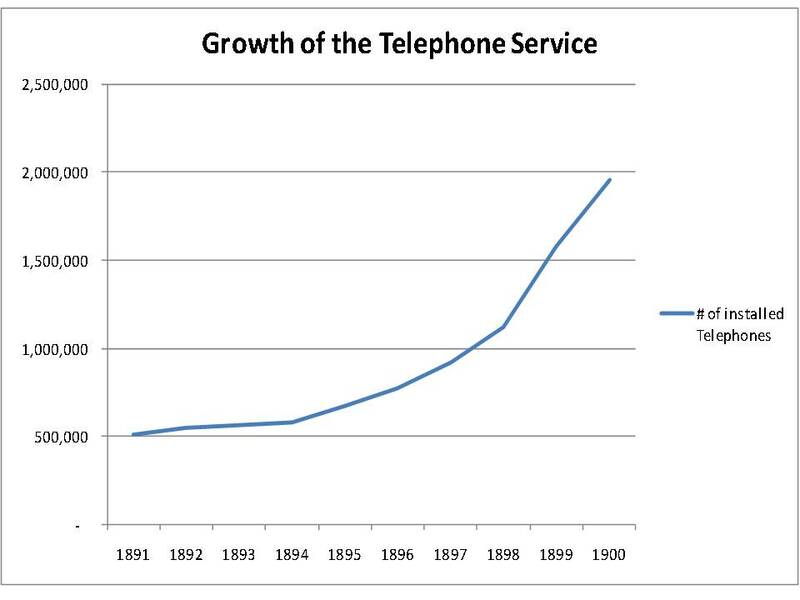 Growth of the Telephone Service. New York Times. http://query.nytimes.com/mem/archive-free/pdf?res=F60616F83C5F12738DDDAA0A94DA415B818CF1D3, December 23, 1901. 3. Worldwide Telephone Distribution. Siemens Internations Telephone Statistics, 1977. http://books.google.com/books?id=SnjGRDVIUL4C&pg=PA229&lpg=PA229&dq=AT%26T+telephone+statistics&source=bl&ots=qI9WfDe4T7&sig=BbtoYslEX_QMIn28Qn4Zk0DKPrY&hl=en&ei=Y4kHTpX5FoHu0gHn1JD0Cg&sa=X&oi=book_result&ct=result&resnum=5&sqi=2&ved=0CD0Q6AEwBA#v=onepage, 1976. 4. Motorola DynaTAC 8000x. http://www.retrobrick.com. 5. Telephone lines per 100 population. http://unstats.un.org/unsd/mdg/SeriesDetail.aspx?srid=755. 6. News, CBS. Percentage of cell phone-only U.S. homes doubles. s.l. : http://www.cbsnews.com/stories/2011/04/23/earlyshow/saturday/main20056730.shtml, 2011.